Cho Jung-rae novel writer. Presented a blueprint for economic democratization After three years, artistic worry about the future of our country, including China, the global economic outlook led to insights into the writing and come to fruition with the each volume per the 1200 manuscript consists of a total of 3600 pieces of each of the former three volumes have been completed. 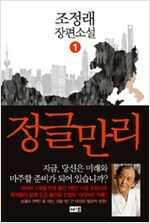 The author wrote the center of the world economy and China's dynamic changes emerge as G2 in Korea, China, Japan, the United States, France, the five countries of businessmen to grab breathtaking economic war draws exciting. 'Kkwansi (关系)' can not be stuck there without chasing success in the great variety of their desires and amtu unfolds against the backdrop of Chinese capitalism. In addition, the rapid development of all facets of pollution problems, China's distinctive 'runtaidduo(many people)', the neglect of the social conditions of life takes place in a living back home for the poor of the metropolis reduced to a state of low-income migrant workers, etc. the growth of the dangers of speeding, revealing what is a human being should chew multiply. It also surrounds the huge business that competes Korea and Japan is not bound to encounter the past history of the businessmen and the subtle emotions flowing on the other side has picked up precisely.